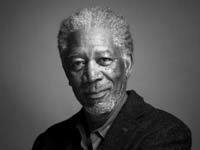 Morgan Freeman is famous for the many movies that he has starred in or had a role in, but he is also famous for his activism work. Freeman was married to Myrna Colley-Lee from 1984 to 2010, and before that he was married to Jeanette Adair Bradshaw, from 1967 to 1979. Freeman has also served in the United States Military. He spent seven years in the Air Force. Freeman’s first film appearance was in the 1971 film titled “Who Says I Can’t Ride A Rainbow?” However, Freeman became known in America by first making appearances on the American Soap Opera “Another World,” as well as “The Electric Company,” which was a kid’s program that aired on PBS. However, Freeman started to land more supporting roles in the 1980’s. The films that he was appearing in were feature films, and this was when he started to become a well-known movie actor. As he became more and more known he started to get bigger roles, which included parts in films such as “Driving Miss Daisy” and “Glory.” Both of these films were released in 1989. In 1994 he landed a major role in one of the most successful films of that time; the film was “The Shawshank Redemption.” In 1995 he went on to star in “Break” and from then on he appeared in many films, earning him the title of one of the best actors alive today. Freeman is not only an actor, but he is an activist as well. He has done a lot of charitable work. Back in 2004 he started what is called the Grenada Relief Fund, which was set up to help the people of the island of Grenada, as they were affected by hurricane Ivan. The fund eventually changed its name, and now it is designed to help people get prepared for a hurricane. Freeman is known for providing his voice for narrating roles, and he has narrated many films for Global Organizations, including One Earth, which is an organization that raises awareness about environmental issues. The actor is also known for donating money to different places, such as the Mississippi Horse Park, which is owned by the Mississippi State University. In 2008 the actor endorsed President Barack Obama; however, he announced that he would not join the president’s campaign. , He also narrates for The Hall Of Presidents in Orlando, Florida at the Walt Disney resort. The actor has received honors from various institutes, and some of these honors include the Lifetime Achievement Award at the Mississippi Best Awards. He was given the award for the work he does in movies, as well as for what he has accomplished off of the big screen. In 2013, he was presented with the Doctorate of Humane Letters from Boston University. The actor is still doing a lot of narrating work, as well as acting on the big screen. He also continues his charitable efforts.